These guidelines basically remind us that we should focus on life style changes to best prevent heart disease, heart failure and atrial fibrillation. These changes, of course, should be permanent. It is estimated that life style changes translate into 80% risk reduction of heart disease. These recommendations are based on 9 topics: risk estimation, diet, physical activity, obesity, diabetes, cholesterol, hypertension, giving up smoking and the use of aspirin. Social factors have been one of the most difficult fronts and the one with most impact. Physicians seldom show concern about whether patients can afford the drugs we prescribe, or whether they will be able to follow a healthy diet. Read also: ACC 2019 | SAFARI: Unexpectedly, Radial Approach Offers No Benefits In STEMI. Moreover, we should routinely try to detect psychosocial stressors and support our patients with savvy advice. For adults between 40 and 75, we recommend screening for traditional risk factors and estimating cardiovascular risk at 10 years (recommendation class I). For patients between 20 and 39, it is reasonable to assess risk factors every 4 to 6 years (recommendation class IIa). Read also: ACC 2019 | POET: Oral Antibiotics with Good Long-Term Results for Endocarditis. Patients presenting intermediate or border risk could be better stratified with other markers such as family history, metabolic syndrome, chronic kidney disease, or C-reactive protein. Guidelines also suggest consuming more vegetables, fruits, legumes, whole grains and fish, as well as warning against the consumption of salt, fired foods, processed meats and sugary drinks. They recommend 150 minutes of moderate activity (walking, swimming, cycling) or 75 minutes of a more vigorous activity, and if neither were possible, at least 10 minutes can make a significant difference. 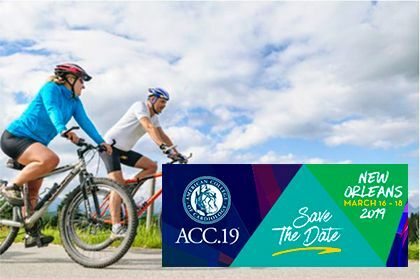 Read also: ACC 2019 | Having an Infarction at Very Young Age or 10 Years Later Does Not Change Long-Term Mortality. As regards aspirin, it is not recommended as primary prevention in >70-year individuals, or with increased bleeding risk (recommendation class III). For individuals between 40 and 70, aspirin can be considered if there is high cardiovascular risk or low bleeding risk (recommendation class IIb). For most patients, aspirin is not indicated as primary prevention. Original title: 2019 ACC/AHA guideline on the primary prevention of cardiovascular disease. Reference: Arnett DK et al. Circulation 2019; Epub ahead of print.